McCOY’S ROMANCE LINE IS AMONG MY MCCOY FAVORITES -- THIS LISTING HAS A GORGEOUS PITCHER AND BOWL IN EXCELLENT CONDITION!PITCHER MEASURES 7 ¼” TALL (AT TALLEST) AND BOTTOM IS MARKED 7541, USA.BOWL MEASURES 8 ¾” DIAMETER, 2 ½” TALL, AND BOTTOM IS MARKED 7551, USA. THIS IS A BEAUTIFUL SET! I HAVE SEEN A LOT OF McCOY PITCHER AND BOWL SETS BUT THIS IS THE FIRST ONE I’VE SEEN WITH A “HOUSE BLESSING” ON IT! PITCHER AND BOWL ARE A BEAUTIFUL LIGHT SKY BLUE COLOR. BOWL MEASURES 8” DIAMETER, 2 1/4” TALL, AND BOTTOM IS MARKED: 7528, McCOY, LANCASTER COLONY (MARK), USA.PITCHER MEASURES 5” TALL (AT TALLEST) AND BOTTOM IS MARKED 7528, USA.THE VERSE IS ON ONE SIDE AND READS: “BLESS THIS HOUSE, OH LORD WE PRAY, MAKE IT SAFE BY NIGHT AND DAY.”BOTH PIECES ARE IN EXCELLENT CONDITION. WOULDN’T THIS BE A WONDERFUL HOUSE WARMING GIFT? 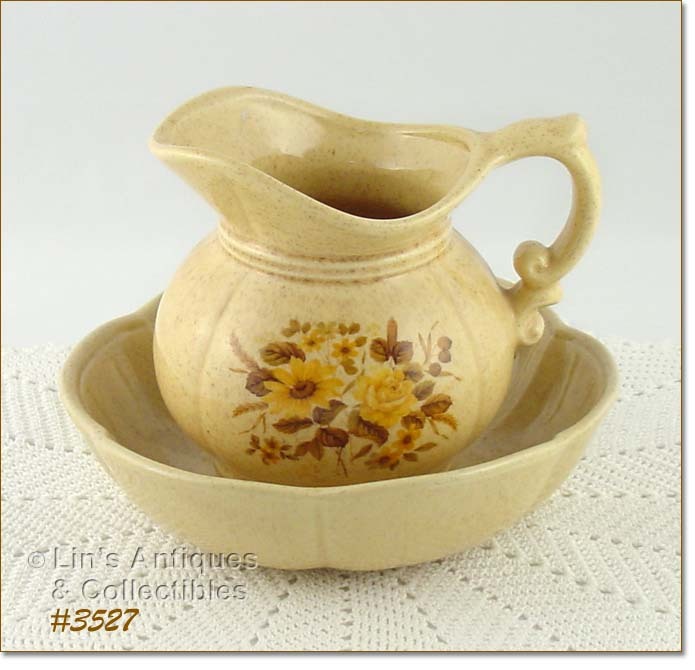 THIS LISTING HAS A MCCOY PITCHER AND BOWL IN THE BEAUTIFUL ROMANCE PATTERN! BOWL MEASURES 7 ¾” DIAMETER, 2 ¾” TALL, AND BOTTOM IS MARKED 7511, USA. BOTH PIECES ARE IN EXCELLENT CONDITION – THEY LOOK NEW AND UNUSED! THIS LOVELY MCCOY LISTING HAS ONE OF MY FAVORITE PATTERNS – PINK PEONIES – AND MY FAVORITE SIZE AND SHAPE PITCHER AND BOWL! PITCHER MEASURES 7 ½” TALL (AT TALLEST), BOWL MEASURES 3” TALL, 9” DIAMETER. PITCHER IS MARKED 7541, USA AND THE BOWL IS MARKED 7551, USA. 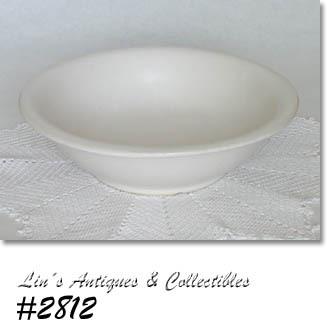 BOTH PIECES ARE IN SUPER CONDITION – NO CHIPS, DINGS, OR CRACKS – BOWL HAS VERY PRETTY CRAZING. LOVELY SET! PRODUCED IN 1974, THIS IS ONE OF MCCOY’S PRETTIEST PITCHER AND BOWL SETS AND IS ALSO PROBABLY THE LARGEST! IT’S IN BLUE AND WHITE (REMINISCENT OF FLOW BLUE) AND IT’S GORGEOUS! PITCHER MEASURES 10 ½” TALL (AT TALLEST), BOTTOM IS MARKED MCCOY (IN CIRCLE WITH LINES), USA. IT HAS SOME CRAZE MARKS ON BOTTOM AND SOME TYPICAL PRODUCTION MCFLAWS – NON-GLAZE, ETC – NOTHING DETRIMENTAL. THE BOWL MEASURES 5” TALL, 14” LONG, 13” WIDE AND BOTTOM HAS MCCOY’S OVEN PROOF KITCHEN MARK AND 7519. IT ALSO HAS SOME NON-DETRIMENTAL MCFLAWS. THERE ARE NO CHIPS, NO CRACKS ON EITHER PIECE. THIS IS AN EXCEPTIONAL SET THAT IS DIFFICULT TO FIND! 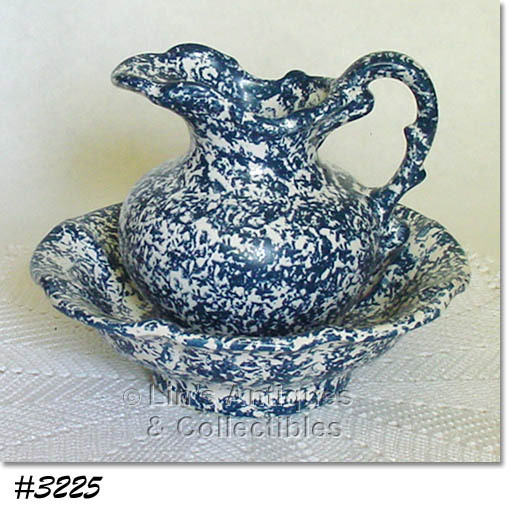 MCCOY’S BLUE COUNTRY IS SO PRETTY -- THIS LISTING HAS THE LARGER SIZE PITCHER AND BOWL! PITCHER MEASURES 9 1/8” TALL (AT TALLEST), 4 ½” DIAMETER, BOWL MEASURES 3 ½” TALL, 12” DIAMETER. PITCHER IS MARKED ON BOTTOM: 7527, MCCOY LANCASTER COLONY (MARK), USA. BOWL IS MARKED 7516, MCCOY (IN CIRCLE WITH LINES), USA. SET IS IN EXCELLENT CONDITION – NO CHIPS, NO CRACKS, NO CRAZING – LOOKS NEW! VERY NICE! THIS IS A VERY PRETTY McCOY PITCHER AND BOWL SET! THE PATTERN NAME IS OLD HERITAGE. THE COLOR IS YELLOW WITH LOTS OF LITTLE TAN “SPECKLES” AND THE PITCHER HAS A YELLOW SUNFLOWER AND A YELLOW ROSE WITH BROWN LEAVES. PITCHER MEASURES 5 1/4” TALL (AT TALLEST), BOWL MEASURES 2 1/4” TALL, 7 3/4” DIAMETER, AND BOTH ARE MARKED 7528, USA. BOTH PIECES ARE IN EXCELLENT CONDITION – THE PITCHER HAS A 1/2” PRODUCTION STRESS INSIDE BOTTOM THAT IS OF NO CONSEQUENCE WHATSOEVER! 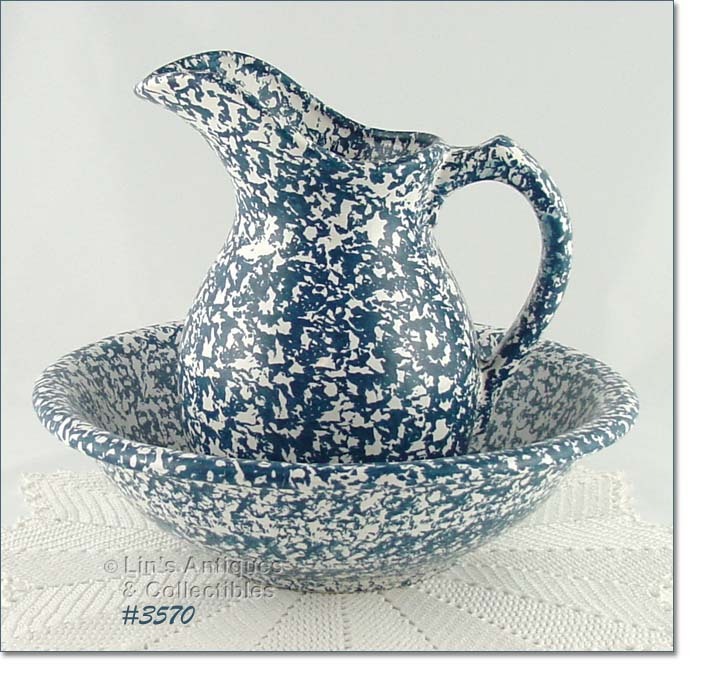 THIS LISTING HAS A VERY PRETTY PITCHER AND BOWL SET FROM MCCOY’S BLUE COUNTRY LINE! PITCHER MEASURES 5 ¼” TALL (AT TALLEST), BOWL IS 2 ½” TALL, 7 ¾” DIAMETER. PITCHER HAS NON-GLAZED BOTTOM AND IS UNMARKED, BOWL IS MARKED MCCOY (IN CIRCLE WITH LINES). BOTH PIECES ARE IN EXCELLENT CONDITION AND HAVE VERY PRETTY COLORS! BEAUTIFUL AND MINT CONDITION MCCOY PITCHER AND BOWL SET! BOWL IS BEIGE COLOR WITH LOTS OF LITTLE “SPECKLES”, MEASURES 7 ¾” DIAMETER, 2 ½” TALL AND BOTTOM IS MARKED 7528, USA. 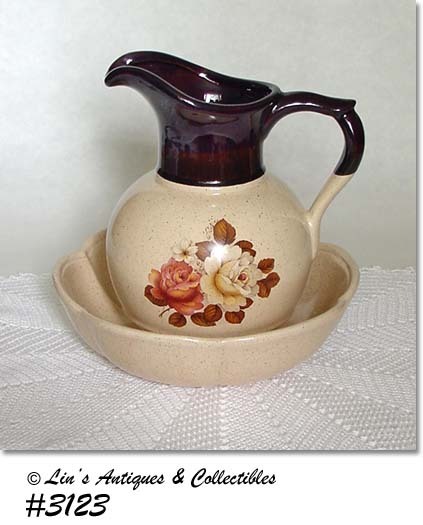 TOP PART OF PITCHER IS DARK BROWN, BODY IS BEIGE WITH “SPECKLES” AND HAS BEAUTIFUL ROSES ON FRONT. MEASURES 7 ½” TALL (AT TALLEST) AND BOTTOM IS MARKED 7541, USA. LOVELY!! 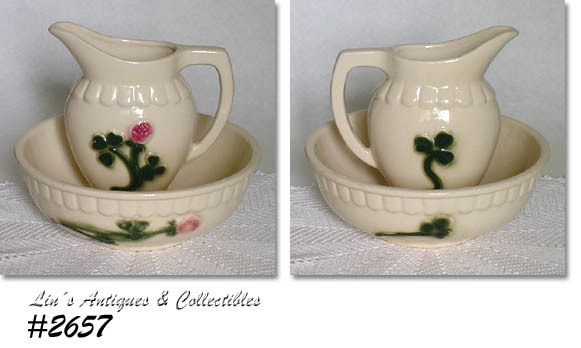 REALLY CUTE LITTLE MCCOY PITCHER AND BOWL SET! 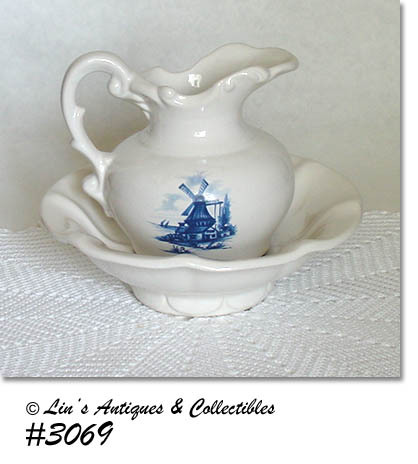 VERY DECORATIVELY STYLED, SET IS WHITE AND PITCHER HAS BLUE WINDMILL SCENT DECAL. PITCHER MEASURES 5 ¼” TALL (AT TALLEST), BOWL IS 2 5/8” TALL, 7 ¾” WIDE. PITCHER AND BOWL ARE IN MINT CONDITION – BOWL HAS A SLIGHTLY DARKER AREA IN BOTTOM AND A DARK DOT ON EDGE, BOTH ARE UNDER GLAZE AND ARE PRODUCTION NOT “USE”. VERY PRETTY! ANOTHER VERY PRETTY MCCOY PITCHER AND BOWL SET! THIS ONE IS FROM THE STRAWBERRY COUNTRY LINE AND IS IN EXCELLENT CONDITION WITH NO CHIPS, NO CRACKS, NO CRAZING. MARKED ON BOTTOM: 7528, MCCOY, LANCASTER COLONY (MARK), USA. 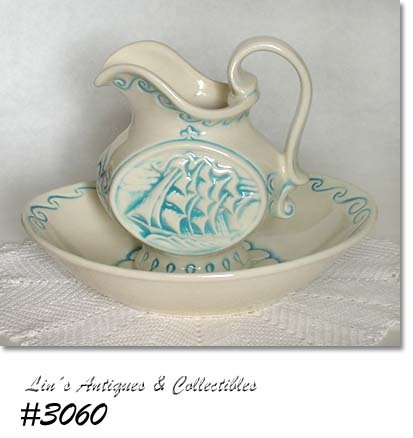 MCCOY PRODUCED MANY DIFFERENT PITCHER AND BOWL SETS AND THIS IS ONE OF THE PRETTIEST SHOWING A TALL SHIP IN FULL SAIL! THIS SET IS WHITE WITH BLUE ACCENTS AND IS MARKED MCCOY (IN CIRCLE WITH LINES). IT’S IN EXCELLENT CONDITION – BOWL HAS A COUPLE DARK SMUDGES UNDER THE GLAZE – PRODUCTION AND IS NOT DETRIMENTAL. 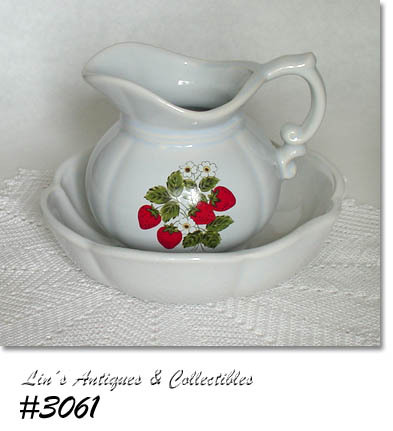 BEAUTIFUL MCCOY PITCHER AND BOWL SET -- THE PATTERN NAME IS "ROMANCE"! 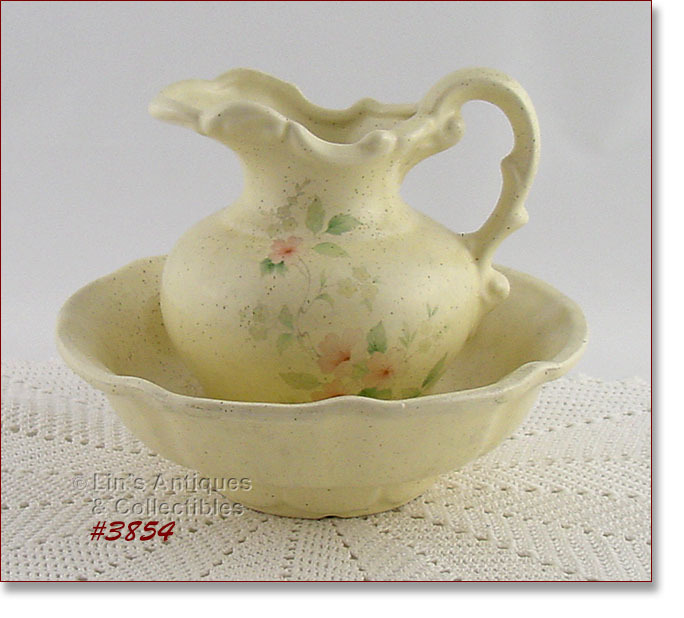 SET IS A SOFT YELLOW COLOR WITH LOTS OF LITTLE “SPECKLES” AND HAS A SEMI-MATTE GLAZE. PITCHER HAS 3 PASTEL PEACH/PINK COLOR BLOOMS WITH PASTEL GREEN COLOR LEAVES – REMINDS ME OF ROSE OF SHARON. 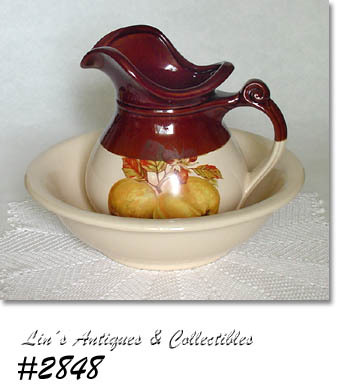 PITCHER AND BOWL ARE DECORATIVELY SHAPED, BOWL MEASURES 2 ½” TALL, 7 ¾” DIAMETER, PITCHER IS 5 ¾” TALL (AT TALLEST). BOTH ARE MARKED ON BOTTOMS: 7511, USA. EXCELLENT CONDITION – SET LOOKS NEW AND UNUSED! LOVELY PATTERN ON THIS MCCOY PITCHER AND BOWL SET – WILD VIOLETS! PITCHER AND BOWL ARE WHITE WITH A BLUE CAST/TINGE AND THE PITCHER HAS PURPLE WILD VIOLETS ON FRONT. BOTH ARE MARKED: 7528, MCCOY, LANCASTER COLONY (MARK), USA. EXCELLENT CONDITION! ANOTHER LOVELY MCCOY PITCHER AND BOWL SET! THESE ARE THE WHITE WITH BLUE TINGE/CAST, BOWL IS SOLID COLOR, PITCHER HAS PRETTY PURPLE WILD FLOWERS ON FRONT. PITCHER MEASURES 5 ½” TALL (AT TALLEST), BOWL IS 2 ¼” TALL, 8 ¼” DIAMETER AND BOTH ARE IN EXCELLENT CONDITION WITH NO EVIDENCE OF “USE”. THE BOWL HAS A ¼” STRESS ON RIM – PRODUCTION AND OF NO CONSEQUENCE. MARKED ON BOTTOM: 7528, MCCOY, LANCASTER COLONY (MARK), USA. VERY PRETTY! 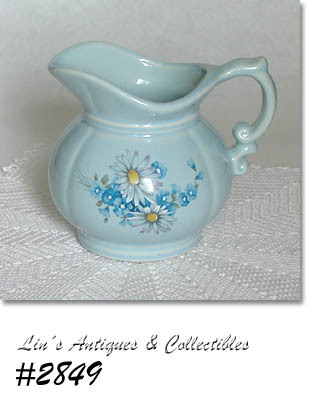 VERY PRETTY BLUE MCCOY PITCHER! IT’S A SKY BLUE COLOR WITH BLUE FLOWERS ON FRONT. FLOWERS ARE ESPECIALLY PRETTY AND APPEAR TO BE HAND PAINTED. MARKED ON BOTTOM: 7528, USA. PITCHER IS IN EXCELLENT CONDITION BUT HAS LOST ITS’ BOWL. PERHAPS YOU HAVE THE BOWL TO MAKE THE SET COMPLETE OR THE PITCHER CAN BE USED AND ENJOYED AS IS! 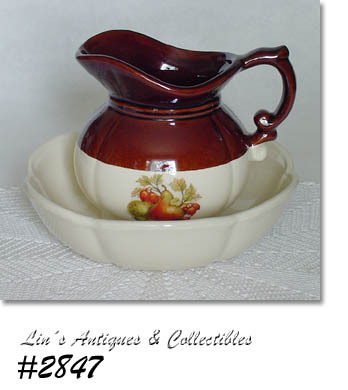 ANOTHER LOVELY MCCOY PITCHER AND BOWL SET FROM THE FRUIT FESTIVAL LINE! THIS IS THE LARGER SIZE – BOWL IS 10 ¾” DIAMETER, 3” TALL, PITCHER IS 7 ½” TALL (AT TALLEST). BOTH ARE MARKED: 7515, MCCOY, USA. EXCELLENT CONDITION – NO CHIPS, NO CRACKS! VERY PRETTY. 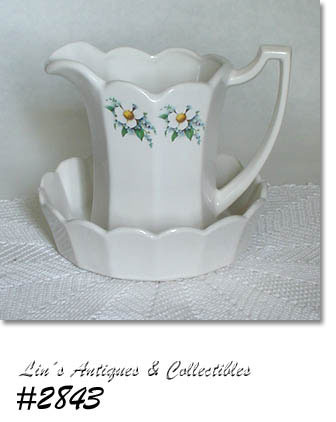 VERY PRETTY MCCOY FRUIT FESTIVAL PITCHER AND BOWL SET! THIS IS THE SMALLER SIZE (PITCHER IS 5 ½” TALL, BOWL IS 8” DIAMETER, 2 ¼” TALL), MARKED ON BOTTOM: 7528, MCCOY, LANCASTER COLONY (MARK), USA. EXCELLENT CONDITION – NO CHIPS, NO CRACKS – BOWL HAS A ¼” SUPER TIGHT STRESS ON RIM THAT IS PRODUCTION AND OF NO CONSEQUENCE. NICE SET WITH PRETTY COLOR! 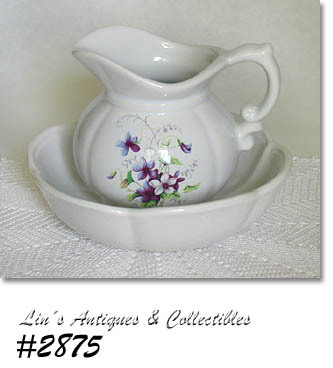 SUPER NICE PITCHER AND BOWL SET FROM McCOY’S PRETTY FLORAL COUNTRY LINE! 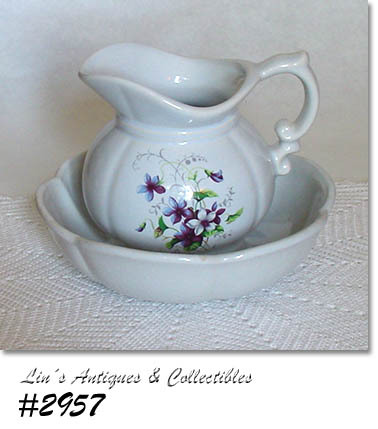 VERY DECORATIVELY STYLED – PITCHER HAS A SCALLOPED EDGE AS DOES THE BOWL. PITCHER MEASURES 5 ¾” TALL (AT TALLEST), BOWL IS 2” TALL, 7 1/8” DIAMETER. BOTH ARE MARKED: 7533, McCOY, LANCASTER COLONY (MARK), USA. McCOY'S FLORAL COUNTRY IS SUCH A PRETTY LINE AND FOR WHATEVER REASON, ITEMS ARE NOT PLENTIFUL ON THE SECONDARY MARKET. THIS IS A NEAT ITEM – A MCCOY MATTE FINISH WHITE BOWL FOR USE WITH A PITCHER! BOWL MEASURES 10 ¾” DIAMETER, 3” TALL, AND IS MARKED ON BOTTOM: MCCOY, 7515, USA. IN WONDERFUL CONDITION WITH ONLY “USE” EVIDENCE BEING A TINY (1/16”) DING ON RIM EDGE AND VERY, VERY MINOR INTERIOR CRAZING! HAS A FEW TYPICAL MCCOY PIN-POPS THAT ARE OF NO CONSEQUENCE. I PURCHASED THESE TWO BRUSH CLOVER PIECES TOGETHER AND AM LISTING THEM AS A SET -- THEY APPEAR TO HAVE BEEN TOGETHER A LONG TIME! THE PITCHER IS THE REFRIGERATOR TYPE (MEASURES 7 1/4" TALL AT TALLEST) AND IS MARKED ON BOTTOM: K11, USA. BOWL IS THE LARGEST BOWL FROM A NESTED SET (WAS ALSO SOLD AS A SALAD SERVING BOWL) AND IS MARKED ON BOTTOM: K10, 9, USA. MEASURES 9" DIAMETER, 3 1/4" TALL. BOTH PIECES ARE IN EXCELLENT CONDITION! BOWL HAS SOME CRAZING THAT IS VERY COMMON WITH THIS GLAZE AND IT HAS A COUPLE PRODUCTION GLAZE POPS -- NOT DETRIMENTAL. THE PITCHER HAS THE LEAST AMOUNT OF CRAZING I'VE EVER SEEN ON A CLOVER LINE PIECE -- IT LOOKS NEW! SUPER LISTING. 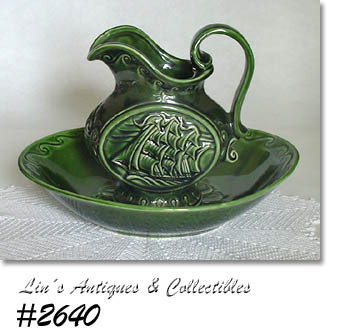 ONE OF MCCOY'S MOST ATTRACTIVELY STYLED PITCHER AND BOWL SETS -- THE CLIPPER SHIP! BOTH PIECES ARE DARK GREEN WITH DARKER GREEN (OR BLACK) ACCENTING AND HAVE SHINY GLAZE. BOWL IS OVAL SHAPE -- MEASURES 11 5/8" LONG, 9 1/2" WIDE (AT CENTER), 2 5/8" TALL. PITCHER IS 7 3/4" TALL (AT TALLEST) AND IS VERY DECORATIVE WITH IN-MOLD CLIPPER SHIP ON FRONT AND BACK. BOTH PIECES ARE MARKED: 7512, MCCOY (IN CIRCLE WITH LINES), USA. EXCELLENT CONDITION WITH NO CHIPS, NO CRACKS, NO CRAZING! SUPER. VERY PRETTY PITCHER AND BOWL SET FROM MCCOY'S BLUE COUNTRY LINE! THIS IS THE DECORATIVELY STYLED SET WITH SCALLOPED RIM ON BOWL AND ON PITCHER. PITCHER MEASURES 6 3/4" (AT TALLEST), BOWL IS 2 1/8" TALL, 7 1/4" DIAMETER. BOTH ARE MARKED MCCOY, LANCASTER COLONY (MARK) -- DIFFICULT TO SEE DUE TO GLAZE FILL-IN. SET IS IN WONDERFUL CONDITION -- NO CHIPS, NO CRACKS, NO CRAZING -- LOOKS NEW! PITCHER HAS A PRODUCTION NON-GLAZE ON INTERIOR BOTTOM AND BOWL HAS SOME LIGHTER BLUE "SPONGE" COLOR MINGLED WITH THE DARKER BLUE -- PRODUCTION AND OF NO CONSEQUENCE. SUPER SET! BEAUTIFUL MCCOY PITCHER AND BOWL SET FROM THE BROWN DRIP LINE! 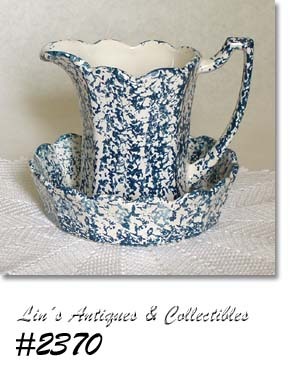 THIS IS THE SMALLER SIZE SET -- PITCHER MEASURES 5 1/8" TALL (AT TALLEST, BOWL IS 7 5/8" DIAMETER, 2 1/2" TALL. BOWL IS MARKED ON BOTTOM: MCCOY (IN CIRCLE WITH LINES), USA. PITCHER IS UNMARKED. SET IS IN EXCELLENT CONDITION -- NO CHIPS, NO CRACKS, NO CRAZING -- ONLY EVIDENCE OF USE ARE SOME "RUB" MARKS INSIDE BOWL CAUSED BY THE PITCHER -- THAT'S IT! VERY PRETTY ITEMS AND VERY DECORATIVELY STYLED.